Manufacturer: Toyota Motor Mfg., Indiana, Inc.
Look at this 2006 Toyota sienna XLe mini van!! 4 wheels of fox lake . 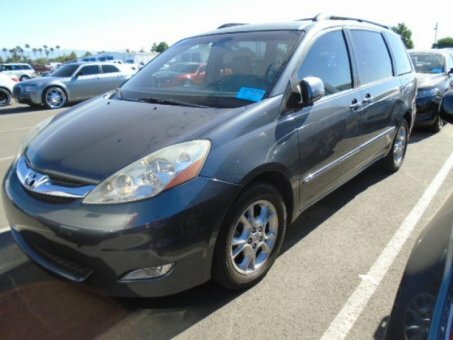 A clean carfax bill of health and 1-owner on this 2006 Toyota sienna XLe mini van!! 87k gray exterior with gray cloth interior 3.3l v-6 auto trans fwd power steering power brakes cruise control jbl am/FM 6-disc cd player power heated side mirrors power windows power locks with keyless entry power sliding side doors and power lift gate rear heat and a/c child safety locks power driver and passenger seats folding 2nd and 3rd row seats alloy wheels outside temperature gauge with compass dual front airbags automatic headlights with fog lights abs intermittent front and rear wipers rear privacy glass roof rack steering wheel controls trip odometer and universal garage door opener! !